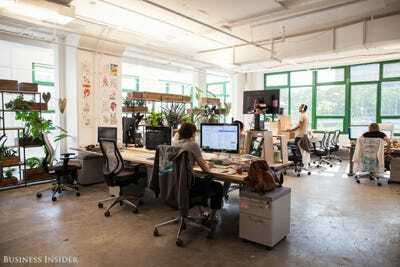 Sarah JacobsOne of Etsy’s many open work stations. 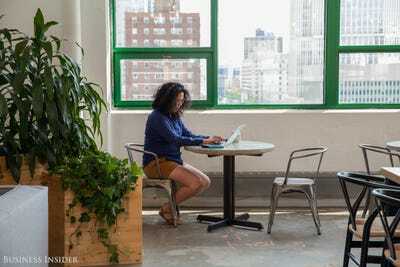 Etsy, the online marketplace where creative entrepreneurs can set up storefronts to sell their own products, launched in 2005 with the goal of creating an online retail space that would build a more fulfilling and lasting world. 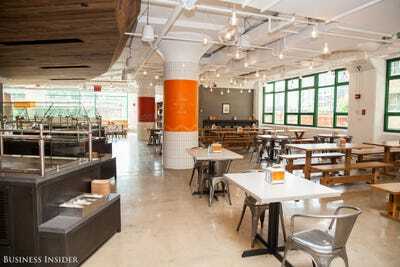 So it’s no surprise that its newest 200,000-square-foot headquarters in the Dumbo neighbourhood of Brooklyn would be filled with toxin-free paint, salvaged wood, and furnishings purchased from Etsy sellers. 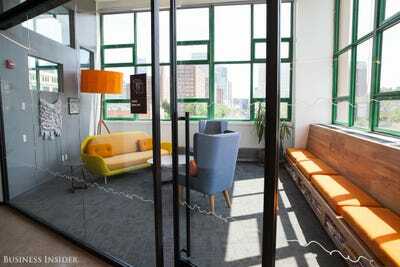 The 496 employees that work in the new state-of-the-art office are free to roam the nine-floor complex, finding a comfy spot to set up camp and work remotely away from their desks. 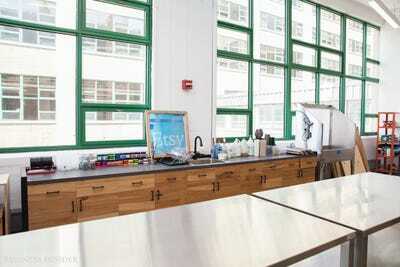 We recently got a tour of the refurbished building the Etsy team now calls home — scroll ahead for the tour. 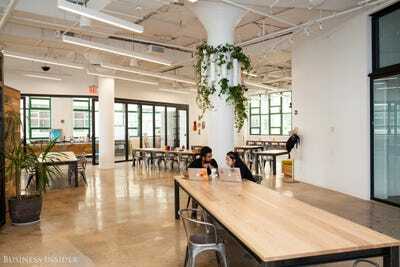 Etsy recently moved from a 106,000-square-foot space to its new headquarters in Dumbo. The new space is a two-building setup that's nearly twice as big, at around 200,000 square feet. Communal space in the 'labs' area of the sixth floor. 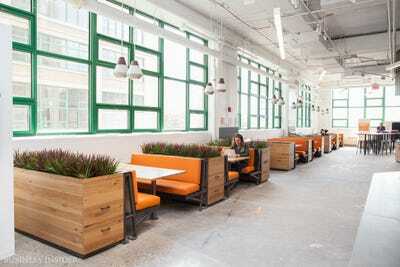 Etsy signed a 10-year lease on the nine-story building. 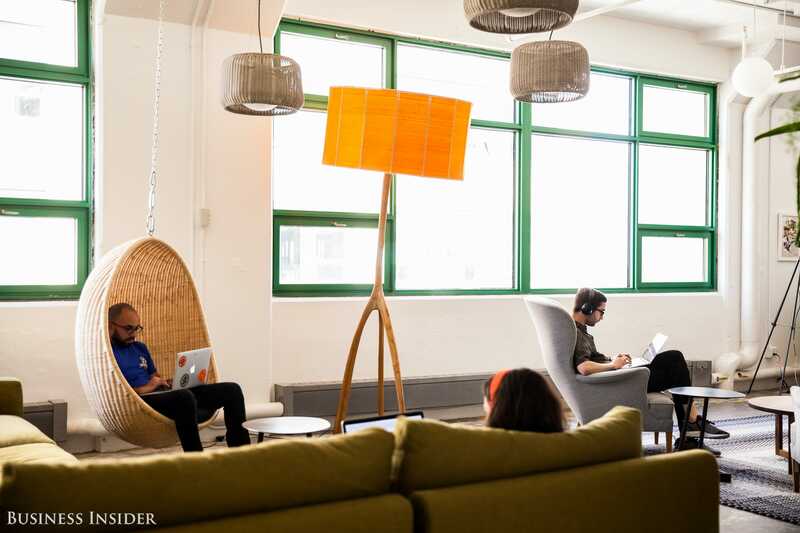 Before the big move, the company sent surveys to its employees, asking them to name their preferences and needs for the future office. Quiet spaces, such as this one, were big on the list of requests. 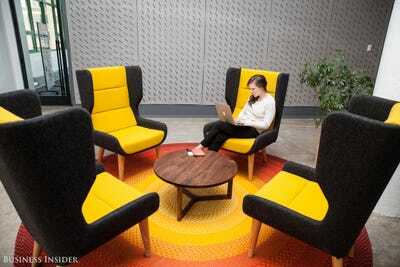 Creating open collaboration spaces was another important factor in the building's design. 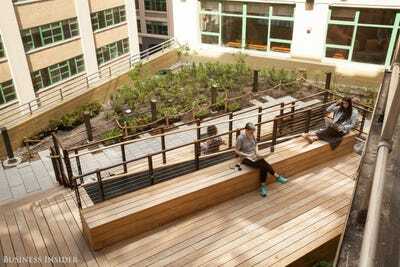 Outdoor courtyards are available for employees to enjoy the sunshine while getting some work done. 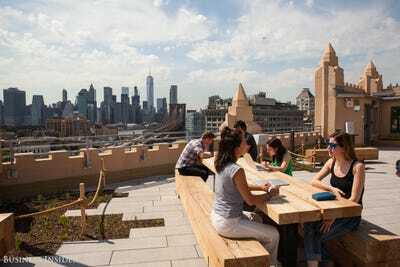 If the courtyard is full, you can also go to the roof. 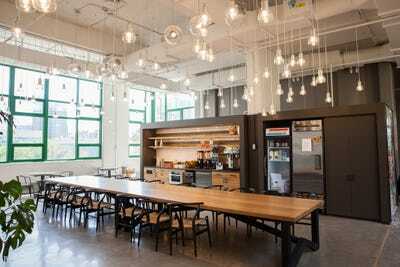 You'll find kitchens and communal eating spaces packed with snacks on each floor. 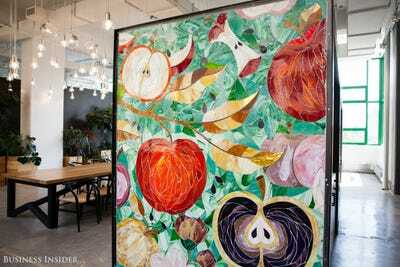 Dining tables from the previous office were painted and hung on the walls as decorative art. 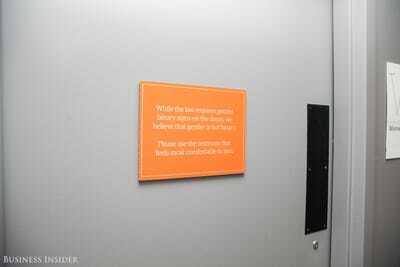 Last December, the company announced a policy to have gender-neutral bathrooms. 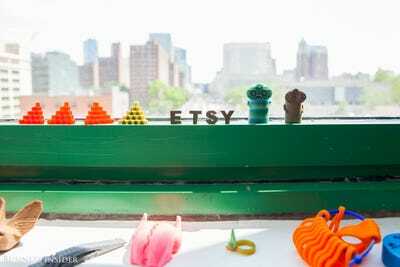 Monthly craft nights are a major event at the Etsy offices. 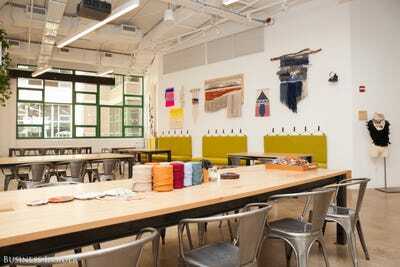 Teachers are invited to host workshops on everything from sewing to weaving and printmaking. 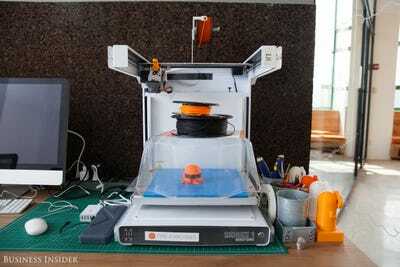 Inside the 'digital lab,' employees can play around with a 3-D printer. There's also a printmaking studio. 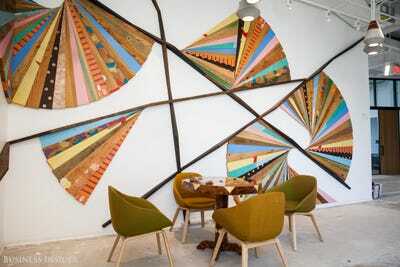 Curated art from various New York-based Etsy sellers graces the walls. 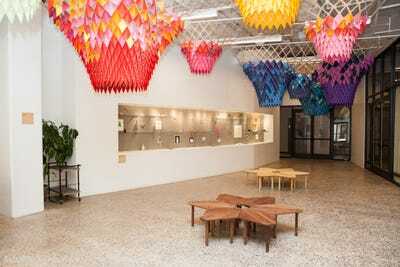 In fact, about 50% of the furnishings in the entire building were made by local artists and Etsy sellers. That includes about 750 pieces of furniture and light fixtures. Environmental sustainability was a major consideration in refurnishing the building. Etsy has been a certified B Corporation since 2012, which means that it is held to rigorous standards of social and environmental performance. 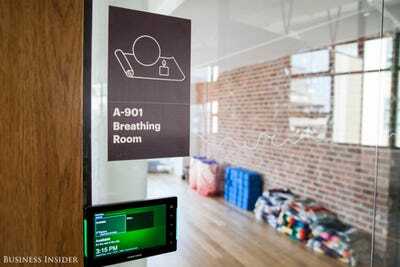 Etsy collaborated with various manufacturers to ensure that everything, from the carpet to the paint, didn't contain the harmful, toxic chemicals that are commonly used in commercial office buildings. All in all, it vetted more than 1,500 items to avoid things that contained harmful or toxic chemicals. All of the wood within the office was either reclaimed or Forest Stewardship Council-certified, which means that it came from responsibly-managed forests. 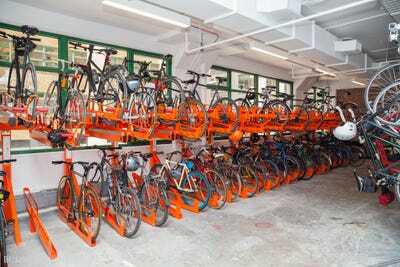 A large bike storage room encourages employees to take a carbon-neutral commute into work. There are also showers on-site. Plants, such as the ones lining the left wall here, are fed by rainwater collected from the roof. 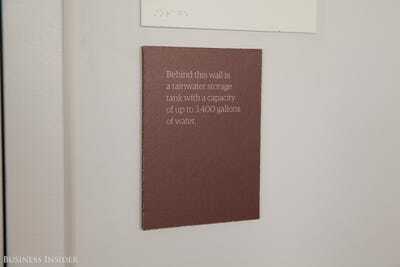 The water is kept in a large storage tank that connects to an innovative irrigation system that also helps reduce runoff and flooding in the neighbourhood. 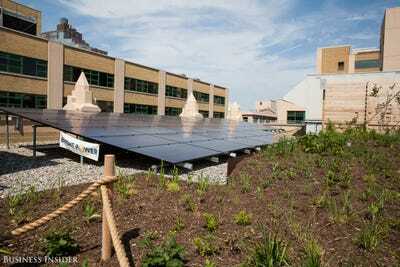 Solar panels on the roof power about 1% of the building; however, the remaining 99% is also powered by local, renewable solar power sourced from a remote location. Large windows that allow ample natural light are expected to save the company approximately 80,000 kilowatt-hours of energy a year. 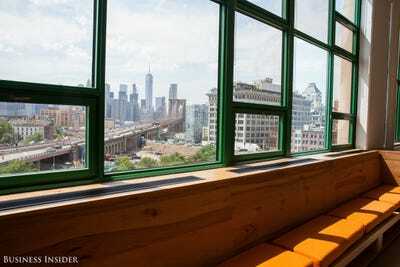 Etsy also provides a gorgeous view of Manhattan. 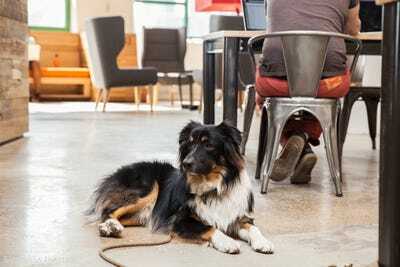 The office is super dog-friendly. 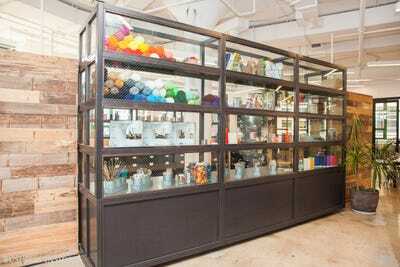 Art collections consisting of Etsy products can be found on various floors -- including in the lobby of the 'Etsytorium,' an auditorium for both private and public events. 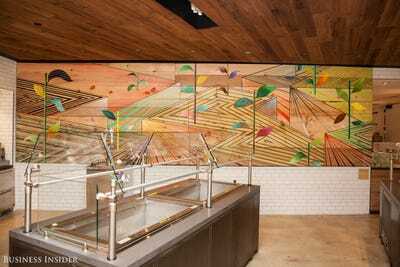 But you'll see lots of bold art throughout the building. 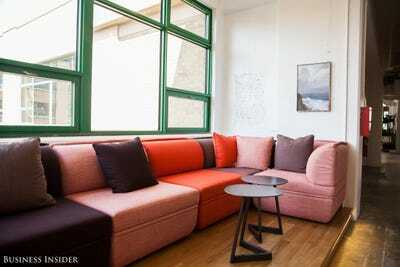 Overall, the building aims to provide a comfortable, safe, and imaginative working environment for everyone. 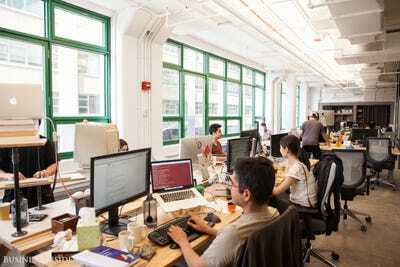 A previous version of this story said 819 employees worked at the Etsy headquarters. There are actually a total of 496 employees.